Please join us for the Opening Reception on Saturday, May 4, 2019 from 6 to 9PM. 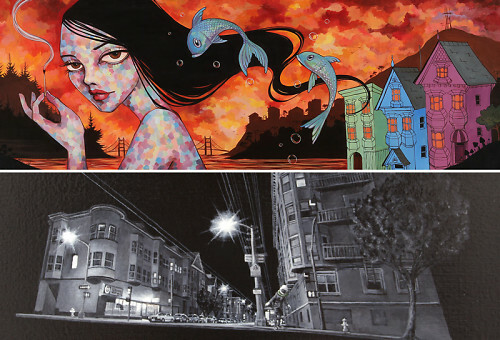 Ursula Xanthe Young is a painter, illustrator, and graphic designer whose urban fairy tale images have become a trademark of street culture in San Francisco and beyond. Her fine-lined illustrations and colorful modern paintings exude a style that is unique and appealing to art lovers of all kinds. Young grew up in the green rural dales of Northern England and studied art in New York, Florence, Vermont, Oslo, and London. After graduating from Parsons School of Design (BFA Illustration 1996), she moved to San Francisco’s Lower Haight district and spent nearly a decade there. Following a stint in Alaska, Ursula has settled in Grass Valley CA, where she now lives and works.